I went to visit my parents last night. I love it. We’ll talk about the most random things sometimes. Sometimes it’s deep, sometimes it’s spiritual, sometimes it’s silly, sometimes it’s just random. Last night it was crepes. Okay, we didn’t talk about crepes the whole time, but it was a topic of conversation. 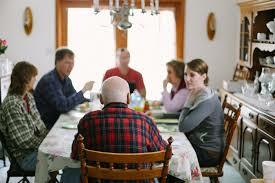 There’s something about food and family, it’s fun to talk about. They had been given a gift certificate to go to a restaurant that focuses on the delicate and diverse, eggy and delightful, yellow and delicious item known as the crepe. 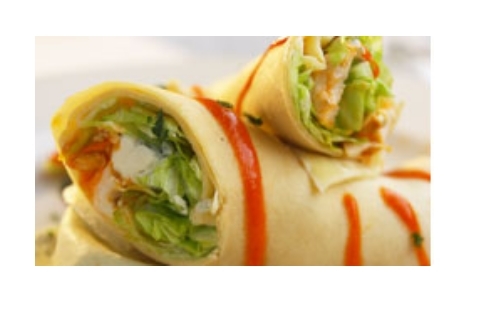 Crepes have almost become a trend. They’re showing up at wedding receptions here and there, and then here and there and everywhere are restaurants dedicated to just the crepe. “Crepe” is actually French for “pancake”. It is very different from the American pancake and is not limited to breakfast. Brittany, France is where these wonderful creations originated, and they usually serve them with cider. Interesting. Believe it or not, they also celebrate the Crepe on their crepe day, which is February 2. It’s probably pretty believable, though, since we celebrate a food almost every day here in America! Here’s what I think is cool about the crepe. It can’t be labeled into a category. There are just too many things you can do with it. It’s a main dish, it’s a side, it’s a breakfast food, it’s a dessert! With its dense yet spongy texture and it’s eggy flavor, it really can go with almost anything. I’ve had them with ham and swiss, I’ve had them with chocolate and cream. My dad was making me crave some when he told me of a buffalo chicken one he tried at that restaurant. (and he said it was huge!) Wow. With a flavor like that, I wonder what else they’ve got. I’ll have to go stop by and try. But luckily, you can make crepes easily enough at home, too. Whenever we had crepes growing up, we would have just a smorgasbord of toppings (typically sweet), and you could come up with as many combinations as your little heart and tongue desired. Options? French Banana? That was one of my favorites. To give you a taste, I’ve given the recipe to you. It has such a great flavor, I make the syrup all the time for pancakes and such, with or without the banana. I am a cinnamon queen, but I promise others are huge fans, too! We usually just slice the bananas and add them to the sauce rather than using the halved banana. And just to make sure we are clear, the copy that I have of the recipe has a “dessert even” written next to it with a smiley face and two exclamation points next to that. It’s breakfast or dessert, and it is yummy. Sift flour and confectioners' sugar into a bowl. Add milk, eggs, butter, vanilla and salt; beat until smooth. Heat a lightly greased 6-in. skillet; add about 3 tablespoons batter, spreading to almost cover bottom of skillet. Cook until lightly browned; turn and brown the other side. Remove to a wire rack. Repeat with remaining batter (make 10-12 pancakes), greasing skillet as needed. For filling, melt butter in large skillet. Stir in brown sugar, cinnamon and nutmeg. Stir in cream and cook until slightly thickened. Add half of the bananas at a time to skillet; heat for 2-3 minutes, spooning sauce over them. Remove from the heat. 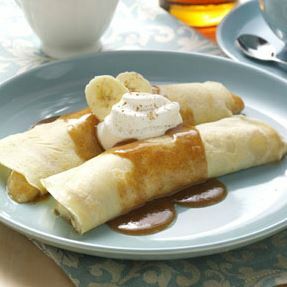 Roll a pancake around each banana half and place on a serving platter. Spoon sauce over pancakes. Top with whipped cream and dash of cinnamon if desired. Yield: 5-6 servings.